Drawing upon its uniquely thermally stable production environment and large diameter interferometric testing facility, Optical Surfaces is able to provide outstandingly accurate test data on its reference and transmission flats up to 600mm (24 inches) in diameter. 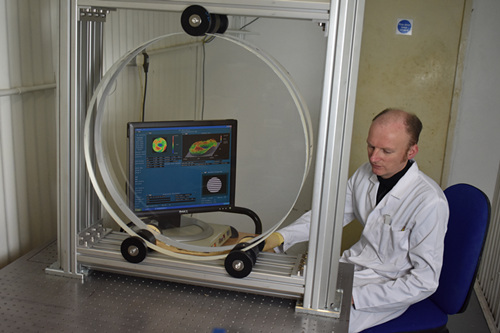 This interferometric set-up allows direct qualification of large diameter flats (up to 600mm diameter) without the need to use time-consuming combination methods which are prone to potential accuracy errors. In addition to standard flats, Optical Surfaces offers special options for non-circular shaped flats, higher surface accuracy / quality, precision mounts, light-weighted options and an extensive range of coatings for demanding applications. All reference and transmission flats from Optical Surfaces come with full quality testing assurance. For further information please visit https://www.optisurf.com/index.php/products/flats-and-windows/flats/ or contact Optical Surfaces Ltd. on +44-208-668-6126 / sales@optisurf.com.